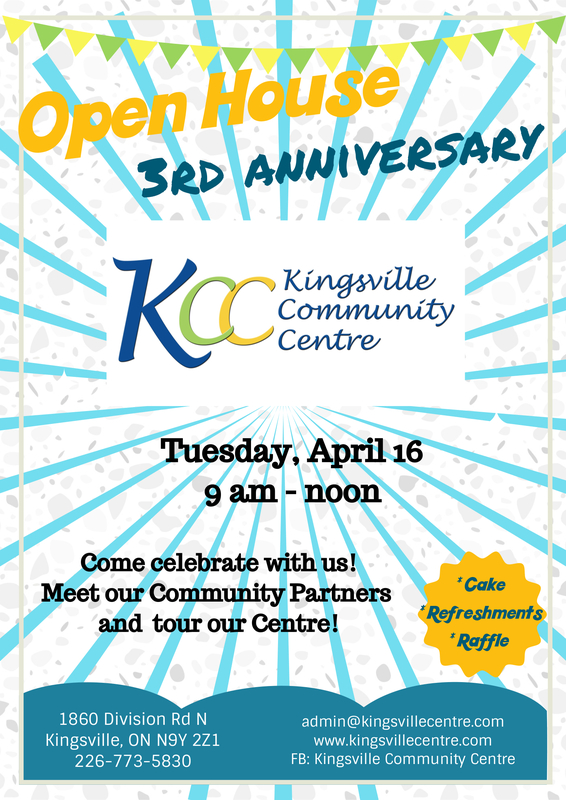 Kingsville Community Centre 3rd Anniversary & Open House. There will be a Health Expo featuring our community partners, Community Centre tours, Volunteer Award presentations, and free cake and refreshments. Kingsville Community Centre is serving vital needs in the town of Kingsville and surrounding communities. The Centre has experienced continued growth since it’s beginning. In 2018 our programs were accessed over 8,900 times by residents of Essex County. At Kingsville Community Centre, we bring people together by networking with local agencies in Windsor and Essex County to provide much needed health, social and educational programs to the town of Kingsville and surrounding communities. Currently we have 15 community partners that provide in excess of 30 programs at No Cost. No cost to attend. Free parking. Gift raffles.